Japan’s two “lost decades” are typically blamed on weak demand – not true. The legacy of “Japan, Inc.” has cut costs leading to lower prices and higher purchases. Thus, policies aimed at increasing purchases per shopper are misguided. For consumption, it’s almost all about population. For production, the need is for innovation. The typical story of Japan is one of weak consumption causing falling prices. The so-called “deflationary mindset” then reinforces a cycle of falling demand and prices. That’s not true. The average consumer has been buying consumer durables (such as electronics and appliances) as prices delightfully fell, and services. More, they kept buying even while suffering through a drumbeat of seemingly dire economic news and Government policy swings. Let’s look at the data … consumption per person has grown. The trouble is that population has been flat. 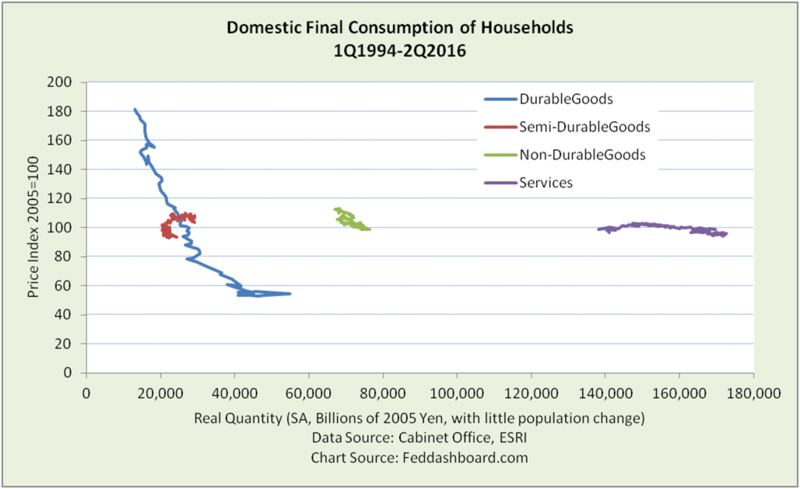 Consumption of sensitive consumer durables was 25% greater in Japan than in the U.S. over the past twenty years. Services growth has also been strong. AND, Japanese shoppers increased purchases while paying down debt from 1997 until 2012. By contrast, U.S. consumers fueled their consumption with credit. Purchases of semi- and non-durables moved little per person – it’s difficult to increase pairs of socks or bowls of rice per person. The chart above is effectively per person because there has been little population change. Clear is the strong growth in durables and services per person. Only since 2Q2014 have purchases struggled in the face of the consumption tax increase to 8% from 5% and the start of Qualitative and Quantitative Easing (QQE). The cut in consumption was about as damaging as the cut during the 2007-2009 financial crisis. Only services purchases are greater today than before the tax increase and QQE. This consumption cut combined with QQE is also the cause of Japan’s stock market bubble. Why did prices fall if purchases grew? Product costs fell. For this, thank the legacy of “Japan, Inc.” for continual improvement (Kaizen) in efficiency, plus government regulatory reform. Shoppers buy more when prices fall. That’s growth, not a bad “deflationary mindset.” Flat or falling prices of goods and scalable services have been the norm across industrial countries – it’s the result of the global tech and trade transformation. Different in other countries is population growth – QQE can’t fix this. More, QQE is based on an outdated assumption that low prices are primarily caused by low demand. This error follows from another outdated assumption about the extent of scarcity – limited people with pickaxes toiling in mines, fields and factories. Scarcity hasn’t been the dominant economic force for decades. Today, there is an abundance of people, structures and even cash – more than needed to produce daily needs. Plus, manufacturing methods have improved with “Japan, Inc.” as a prime example. The problem has been somewhere in the BoJ. Their first error was misdiagnosing the problem as weak consumer shopping. Their second error was thinking higher prices would increase purchases. In the big picture, people have been out shopping and working rather than at home making babies. Prime Minister Abe is encouraging better work-life balance and more children. Third Arrow policies will further reduce costs. What’s the population balance? Leading the world’s most technologically advanced economy; he is the first leader to face new problems to which others are other headed. To boost country purchases, he needs more consumers. Yet, increased efficiency means fewer workers are needed. How to increase exports in the face of anti-trade sentiment and provide income support to people not working due to increasing efficiency? What’s the debt plan? Japanese consumers and government have high debt. An increasingly efficient economy doesn’t cause inflation that would enable debt repayment in lower value yen. Lower product prices also shrink sales taxes. How can innovation blossom again? Global Japanese companies have been good at efficiency gains. Since the end of the 1980s, company management styles haven’t encouraged creativity enough. Just as the Greek debt drama distracted European leaders from the refugee and other problems, Prime Minister Abe is being distracted from the risk posed by QQE. As Japan looks ahead to the 2020 Olympics, PM Abe needs to “get ahead of the game” so that Japan wins an economic gold medal by 2020.